In TechnoBookmaking, students make, print, and share books. The bookmaking lessons have students become authors and illustrators of fiction and non-fiction books. They use templates to make a picture book, flip flap story, unfolding riddle book, layer book of facts, bookmarks, greeting card, and more! Extension activities include additional templates that offer unlimited creativity. Rethink how Google Slides or PowerPoint can be used in language arts. Explore the possibilities with bookmaking. 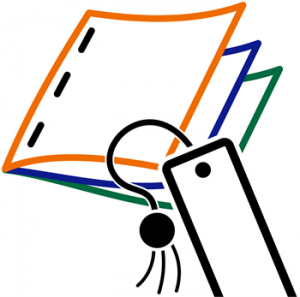 What Is Included with TechnoBookmaking? TechnoBookmaking includes a teacher guide for curriculum planning, student worksheets to support learning, and resources to inspire creativity. The project comes with 14 templates to make accordion, flip, and folding books. In addition, there are 20 sample books that demonstrate how to make bookmaking cross-curricular. As well, the TechnoBookmaking project has customizable assessment tools, parent letter, and certificate. In the technology project, TechnoBookmaking, the bookmaking lessons include detailed instructions explaining how to make books using Google Slides or PowerPoint. Bookmaking has students apply the stages of the writing process to publish books. Use these materials to teach a bookmaking unit or select activities throughout the school year for story writing. A story generator and planning sheet are included with the lesson plans to help students organize ideas. Days of the Week: Learn about the days of the week by making simple picture books using the Accordion Box template. Arrange books on a table using the Stand Up Book folding option. Community: Teach young children about their city or town. Use the Accordion Zig Zag template to write about where they live. This looks great using the Fold Out Book folding option. Family: Use the Accordion Heart template to identify family members. This publication prints best as a Mini Book. Sounds: Explore the senses. 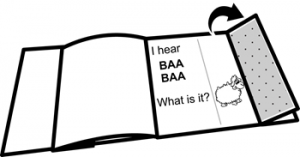 Have students write about the noises they hear. Use the Flip Sounds template. Habitat: Using the Flip template, make a flip flap book called Where do I live? On each page describe the habitat and give clues about who might live there. The flap hides a picture of the animal. Community Helpers: Learn about people working in the community. Create a riddle book with clues about a job using the Riddle template. Animals: Report animal facts in an interesting way. Create a riddle book with clues about animal appearance, diet, and habitat. Seasons: Illustrate the weather and activities people do each season. Use the Layer 4 template to sort the book in Spring, Summer, Fall, and Winter. Map Making: Help students understand where they live in the world. Use the Layer 5 template. Divide the book into the headings Me, My Street, My City, My State, and My Country. Biography: Create a book about an important person. 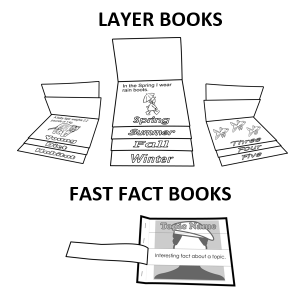 The Layer or Fact templates provide options to divide facts. Landforms: Discover interesting facts about the Earth. Use the Fact template to describe landforms or natural events. TechnoBookmaking has lessons teachers can use to have students make books. Bookmaking is a fun activity that motivates reluctant writers. Spark creativity in your students with bookmaking templates and instructions for Google Slides and PowerPoint.